Football standouts, record-breaking gymnasts, swimming superstars and more! Jewish athletes have earned the spotlight as noteworthy sports figures, despite being such a small percentage of the world's total population. How many of these larger than life characters do you recognise? Claim to fame: Considered one of the greatest power hitters of all time and is still the American League (AL) record holder for most runs batted in (RBIs) by a right-hander in a single season (183 in 1937). Years active: 1930 to 1947 as a player; 1947 to 1961 as a manager and owner. Due to his height (193 cm or 6 feet 4 inches), he played on his high school basketball team—which won the New York City Public School Athletic League championship in 1927. Started his career as the youngest professional baseball player (19) and the first Jewish superstar in American team sports. Originally drafted as a first baseman by the New York Yankees, but refused to play there because the legendary Lou Gehrig was already playing that position. After reluctantly playing (and helping his team win) an important game on Rosh Hashanah, sat out an even more crucial game to observe Yom Kippur...and his team lost. Served as an anti-tank gunner after being inducted into the U.S. Army in 1941 where he served for 47 months and missed four baseball seasons. Returned to baseball in 1945 and hit a home run in his first game back. Joined the Baseball Hall of Fame in 1954 as the first Jewish inductee. Claim to fame: Widely known for his impressive pitching ability, the left-hander was considered one of the most powerful pitchers in the history of baseball. Athletic throughout his school years, Koufax excelled in basketball until coaches discovered his phenomenal pitching ability. One manager said he had the "greatest arm he had ever seen" and another compared the stunning impact of his fastball to the ceiling of the Sistine Chapel. Took night classes in architecture at Columbia University just in case his baseball career didn't work out; drove to class after the last out of his team's 1955 World Series victory. Refused to pitch the first game of the 1965 World Series because it fell on Yom Kippur. Career ended early (when Koufax was only 30 years old) due to elbow arthritis. First wife was Anne Widmark, daughter of Hollywood film star Richard Widmark. Youngest man to be inducted into the Baseball Hall of Fame in 1972, and in 2015 was named by fans as one of the four best living baseball players. Claim to fame: World Light Welterweight Champion (aka Junior Welterweight) in 1930 after defeating American boxer Mushy Callahan. Spent his early life in the East End tenements; there is an English Heritage blue plaque on Noble Court, Cable Street, close to his Stepney neighbourhood. Served as a lather boy to a local barber before learning to box. Due to a technicality, was only acknowledged as World Light Welterweight Champion after defeating Goldie Hess in 1931. Wore a Star of David on his trunks (despite being non-religious) as a way to connect with fans. Known in London as "Whitechapel Windmill" and in America as "Whirlwind" for his speedy punch rate. Bragged that his reputation as a womaniser was his professional downfall, yet his legendary status (rumour has it he dated American film star Mae West) added to the handsome boxer's charm. Became a film stunt man (primarily appearing in Westerns) after retiring from boxing and was promised a wardrobe for life, including an endless supply of bolo ties. 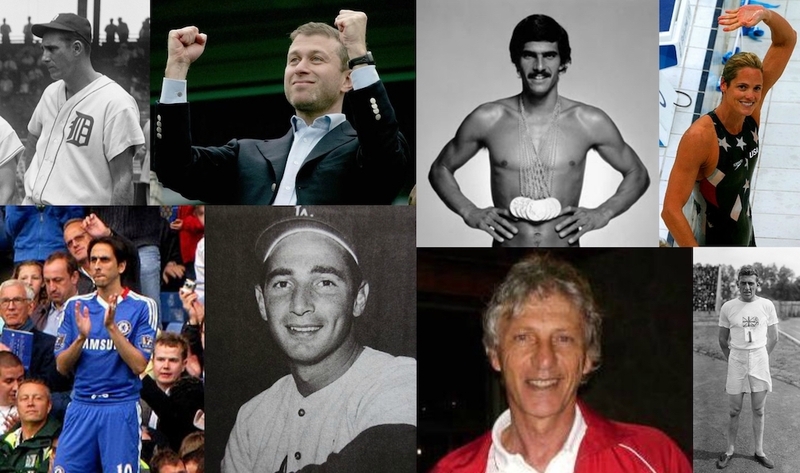 Claim to fame: Russian businessman and owner of the Chelsea Football Club. Earned his wealth in the early 1990s through oil export deals. Involved in Russian politics from 1999 to 2008, serving as governor of Chukotka from 2000 up until his resignation in 2008. Chelsea ended the season as league champions in the second year of his ownership. Sponsors National Academy of Football in Russia, an organisation involved in youth sports programmes. Donated more money ($2.5 billion) to charity than any other living Russian. Owns the world's second largest yacht, the Eclipse, which is 533 feet long and has several extravagant features, including its own submarine. Claim to fame: Israeli professional footballer who played for Liverpool, Chelsea, West Ham and Arsenal. Began playing football seriously in Israel at the age of nine and had to hitchhike with his dad to get to training camp. Was Footballer of the Year in 2000-2001 in the Israeli Premier League. Won two Israeli Premier League titles with Maccabi Haifa (2000-2001 and 2001-2002). Enjoyed his greatest success to date at Liverpool between 2007 and 2010. Was on the 2012-2013 Chelsea team that won the UEFA Europa League. Currently plays for Maccabi Tel Aviv and previously captained the Israeli national football team. Claim to fame: Current manager of the Colombian national football team. Briefly made a living as a taxi driver after an injury ended his uneventful career as a player. Achieved success in 1994 as the coach of the Argentinian youth team, winning the FIFA World Youth Championship in 1995 (Qatar), 1997 (Malaysia) and Argentina (2001) along with the South American Youth Championships in 1997 and 1999. Named coach of the Argentine National Football Team in 2004 and went on to manage in the World Cup in 2006; however, the team was knocked out in the quarter finals after losing to Germany on penalties. Announced his resignation after 2006 World Cup loss and refused to return even after the President of the Argentine Football Association (AFA) tried to convince him to stay. Became the new manager of the Colombian National Football Team in January 2012. Under his leadership in 2014, Colombia reached the World Cup for the first time in 16 years. The team won all three group games (including the defeat of Uruguay in the Round of 16) but lost to Brazil in the quarter finals. Won South American Coach of the Year on three occasions (2012, 2013, 2014). Claim to fame: Dominant gymnast at the 1952 Helsinki Summer Olympics at the age of 31, where she won two gold and five silver medals—the most medals won by any woman in a single Olympics. During the Nazi siege of Leningrad (St Petersburg), volunteered to work in the city's hospitals and was decorated for her efforts. Won the Soviet Union's first Olympic gold medal in 1952—being the first time the U.S.S.R. competed as a country at the Olympics. Ranked 11th in the list of Olympic medals won by a female athlete. Awarded the highest sporting honours by the Soviet Union—the Order of the Red Banner and the Honorary Master of Sport. Moved to Israel in 1990, where she could finally reveal she was Jewish. Claim to fame: Won 10 medals in total over three Olympic games during her career as an artistic gymnast. Was the Hungarian national gymnastics champion by the time she was 16 and subsequently won the title 10 times. Considered a top Olympic contender for the 1940 and 1944 games, which were both cancelled due to World War II. Initially went into hiding and then married another Hungarian gymnast to avoid being taken to labour camps during the war. Her sister and mother also went into hiding and were saved by Raoul Wallenberg, but her father died in Auschwitz. Missed the 1948 Olympics due to an injury, but finally competed in 1952 (Helsinki) and 1956 (Melbourne) with great success. Won a gold and two silvers and a bronze medal at the 1952 Olympics. At the age of 35, became the oldest female gymnast ever to win gold, which she did in 1956. In fact, she won three gold medals and two silvers during the Melbourne games held that year. Due to the Soviet invasion of Hungary, sought political asylum in Australia after the Melbourne games then moved to Israel in 1957 and sent for her mother and sister. Claim to fame: American swimmer who is a nine-time Olympic gold medal winner and former world record holder in seven swimming events. Held 17 U.S. records when he was just 10 years old. First competed internationally in the 1965 Maccabiah Games, where he won four gold medals and was named most outstanding athlete. Had a disappointing showing at 1968 Olympics, only winning two team golds after bragging he'd win six. Won seven gold medals at the 1972 Summer Olympics in Munich, only bettered in 2008 by Michael Phelps who won eight gold medals at the Beijing games. Was protected by the U.S. Marines during the terrorist attack at the Munich games. Retired after Munich Olympics, even though he was only 22 years old. Attempted a comeback in 1992, but was unsuccessful, despite his qualifying time being close to—and sometimes better than—his winning 1972 Olympic times. Won more gold medals than any other Jew in the history of the Olympics. Claim to fame: Most decorated female Jewish Olympian of all time, having competed over a 24 year period. Was awarded 28 All-American swimming honours—the maximum number possible—while in college at the University of Florida, where she also played volleyball in her fifth year. Was part of the 1984, 1988 and 1992 U.S. Olympic swimming teams, winning two gold medals (1984 and 1992), one silver (1988) and one bronze (1988) during this first part of her career. Took a break until 2000, when she returned to Sydney, Australia to win five medals and become the oldest woman to win an Olympic medal in swimming. Converted to Judaism in 2000 to marry her second husband, Itzhak Shasha (a surgeon from Israel). Competed again in 2008 at the age of 41, and despite being much older than her teammates, won three silver medals. In all, won 12 Olympic medals over her career (four gold, four silver and four bronze medals) over five different, non-consecutive games. At the age of 45, attempted to become the oldest Olympic swimmer to ever compete, but missed out a place on the team and announced her retirement in 2012. Claim to fame: Won a gold medal at 1924 Olympics for the 100-metre dash and a silver as the first leg of the 4x100 metre team. Held the English long jump record for 32 years. Achievements during the 1924 Olympics, along with those of teammate Eric Liddell, were the focus of the 1981 Academy Award winning film, Chariots of Fire. Trained as a lawyer at Cambridge and returned to law after breaking his leg while competing in 1925. Wrote about athletics as a journalist and worked for BBC radio as a commentator, covering the Berlin Olympics. Younger brother to the founder of British sports medicine, Sir Adolphe Abrahams, and Olympic long jumper, Sir Sidney Abrahams. Married Sybil Evers, a D'Oyly Carte Opera Company soprano, in 1936. Lived from 1923 to 1930 on Hodford Road in London; an English Heritage blue plaque is displayed on the house in Golders Green. Send an email to contact@jewishcareinteract.org or use the Contact us form if you would like to contribute to this list of Jewish athletes.